Quick post tonight. Wanted to discuss Isaac a tad. 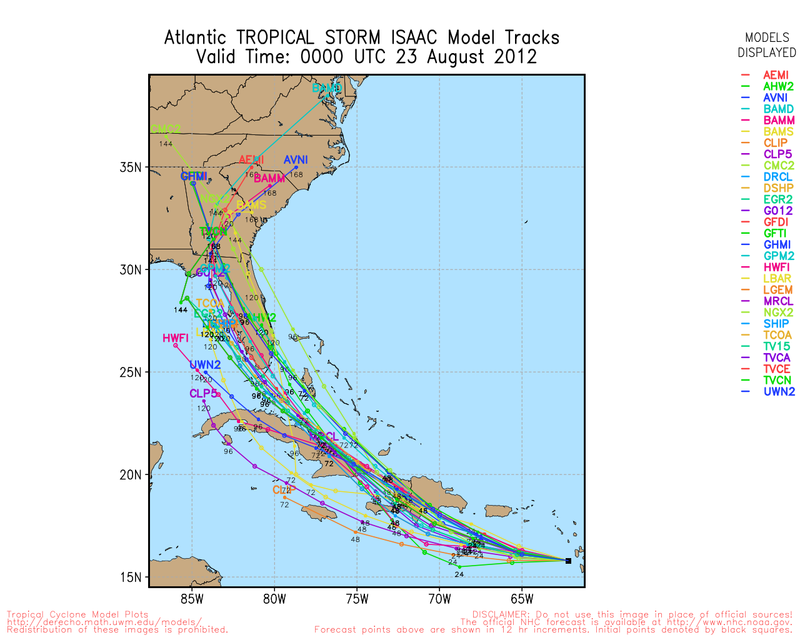 The models have been pushing Isaac’s track to the west over the last 24 hours. All of Florida remains a possibility but southern Florida and into the eastern gulf seem more likely. Tonight’s model outputs, run at 8pm EDT. At the moment the storm is a tropical storm and has maximum winds of 45 mph. It’s beginning to look more organized but still lacks a distinct center. The storm has been strengthening and should continue to as it is in a low-shear environment. As you may recall, shear is a change in wind with height. This will change once it begins to interact with the land masses of Hispanola and Cuba. The ridge is an area of high pressure and winds travel clockwise around it. As a result, a storm to the south of a ridge will be directed west until it circumvents the ridge or the ridge breaks down. The stronger this current ridge is, the further west Isaac’s track will be. From WSI, lets look at where this ridge is. The white lines on the map are called isobars. They mark lines of constant pressure. In the eastern gulf the area of highest pressure is marked by the big blue H. That is the southwest corner of the ridge and winds travel clockwise around it. Isaac is guided by those winds and will make landfall on Florida if the ridge breaks down. Most models predict this to happen but one in particular does not. The ECMWF (European Center for Medium-Range Weather Forecasts) model predicts the ridge to remain strong and push Isaac well into the gulf. The ECMWF’s forecast is definitely one to consider, but it’s just one model of many. Let’s take a look at it’s success last year compared to some of the other models. 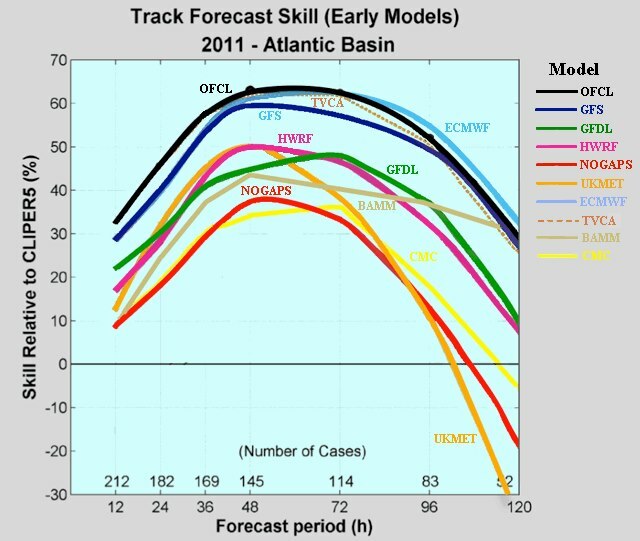 The 2011 hurricane tracking skill of several forecast models. Image from Weather Underground. Also wan to thank Mike’s Weather Page for bringing this image to my attention. ECMWF did pretty well last year, and we’ll have to continue to watch it, as well as the other models over the days to come. For now, anyone in south Florida should be beginning preparations for a landfall.